"The rise of the ‘dual user’ was an indication to us that there is a void in the market, which is leading to compensating behaviors – people using both a bar and body wash. DUOs is our answer to reimagine the shower experience all together." 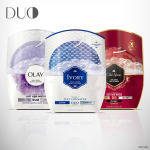 CINCINNATI--(BUSINESS WIRE)--Today Olay, Ivory and Old Spice introduced the latest innovation across Procter & Gamble’s Personal Cleansing Category: DUO. DUO is a dual-sided body cleansing buffer that revolutionizes the look and feel of clean. It is the first time that a brand unites the clean of a bar, the care of a body wash and the experience of a puff to give users a multi-sensory, best of all worlds’ experience. 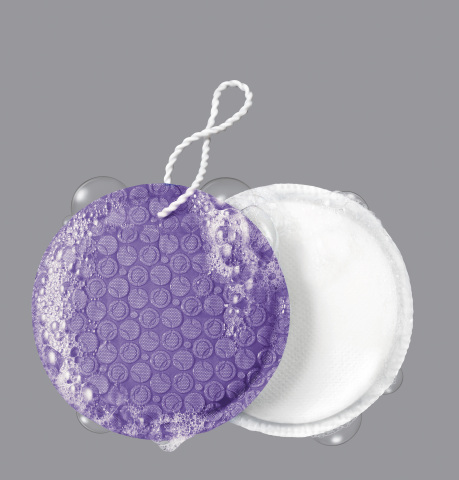 Celebrated as “the never before seen two-sided clean,” the unique design of DUO boasts a flexible cleanser encapsulated by a two-sided cleaning implement – one side is smooth to soften and condition skin, while the other is scrubby, to exfoliate and renew skin surfaces. The flexible cleanser required a new formula consisting of the best cleaning powers of body wash and beauty bars as well as cellulose fiber to give the product its flexibility allowing it to conform to the body for an even closer clean. The scrubby side includes over 10,000 microscrubbers that provide a deeper clean than a body wash puff, while the soft side provides a cotton-like feel for gentle cleansing. The result is a deep, refreshing clean and noticeably invigorated, soft skin after every use. DUO is available in Olay, Old Spice and Ivory featuring Olay and Old Spice’s most popular scents with Olay Soothing Orchid & Black Currant Spice Swagger and Pure Sport, and introducing a new scent from Ivory with Refreshing Clean. DUO is available now in select mass and food retailers and eCommerce nationwide for $9.99 - $12.99 (MSRP). For more information, visit www.cleansingduos.com.